More and more people create their own music and upload new sound to media sharing websites, like the most popular YouTube site. Besides, there are plenty of HD 1080P music videos shared by official channels, like VEVO channel. If you are a music fun, you must have tried to rip audio from YouTube. Generally, YouTube high quality audio files are saved in AAC format. So if you would like to rip audio from YouTube and keep the best quality, downloading YouTube AAC directly without re-encoding is the best way. Compared to MP3, AAC generally perform better than MP3 just at the same or similar bit rates. And the difference in quality is more obvious at lower bitrates. What's more, AAC is the only network broadcast audio format that can get "Excellent" at all EBU listening test project. There are a lot of online plug-ins or third party programs help to download media from YouTube. What makes Bigasoft Total Video Converter stand out from the other YouTube Video Downloader? First, batch downloading AAC from YouTube playlist is possible. Adding URL one by one is a terrible job if you prefer to rip multiple audio files. Secondly, you can decide whether to re-convert YouTube to other formats, like M4R, M4A, MP3 or to just keep the AAC directly from YouTube. The fastest downloading speed is the third advantage of Bigasoft Total Video Converter. The whole YouTube AAC downloading will be finished within seconds. What's more, besides downloading YouTube video or audio, Bigasoft Total Video Converter is capable of converting between almost all video formats, including the uncommon ones, like DAV, TIVO, OPUS, etc. 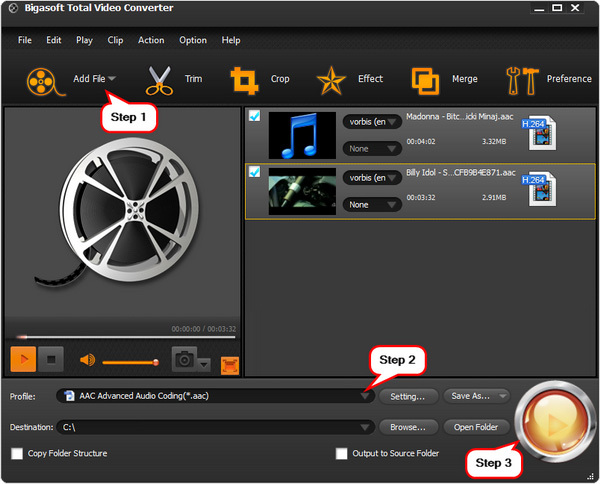 It even features advanced functions like trim, merge, add or remove subtitles, audio tracks. If you have downloaded YouTube media files but can't play, just try to convert it to MP4 or AVI. Besides, Bigasoft Total Video Converter is totally clean and safe, no plug-ins, no ads, no watermark. How to download YouTube to AAC with fast speed? Free download and install the ideal YouTube AAC Downloader - Bigasoft Total Video Converter. There are two different versions for Windows and Mac users separately. Click the right button to download. If you want to download YouTube to AAC, click the "Add File" drop-down button, a drop down menu will pop up. Then choose "Add YouTube Video" and copy the URL of the YouTube video or YouTube playlist. Check "Download Audio Only" and click "OK" to start the downloading. When the downloading is finished, we will return to the main interface automatically. And the downloaded YouTube AAC file will be listed on the right panel. To get the downloaded YouTube AAC file, just click "Open Folder" button on the bottom to open the folder which saved the downloaded AAC file. If you already have downloaded YouTube media with other tools like Realplayer and just want to convert downloaded YouTube video to AAC, please click "Add File" drop-down button and choose "Add File" to browse and select the downloaded YouTube file to import it to Bigasoft Total Video Converter. Then click "Profile" drop-down menu to choose "AAC Advanced Audio Coding (*.aac)" from the "General Audio" category. After the above steps, just click "Convert" button to start the conversion from downloaded YouTube to AAC. Besides downloading and converting YouTube to AAC, you can choose other output audio formats, such as M4R, M4A for iTunes and iPhone. Want to try more functions? 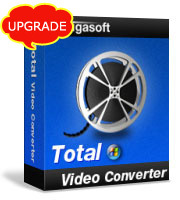 Free download Bigasoft Total Video Converter now!